Achieving Cultural Competency: A Case-Based Approach to Training Health Professionals provides the necessary tools to meet the ever-growing need for culturally competent practitioners and trainees. Twenty-five self-study cases cover a variety of medical topics, including cardiovascular, pulmonary, neurology, oncology, hematology, immunology, and pediatric disorders. Actual scenarios that occurred in clinical settings help the user gain direct insight into the realities of practice today. Cultural factors covered within the cases include cultural diversity plus gender, language, folk beliefs, socioeconomic status, religion, and sexual orientation. 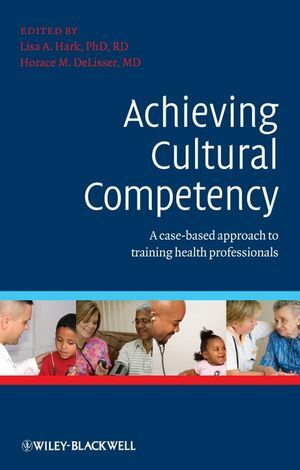 This book is an approved CME-certifying activity to meet physicians’ cultural competency state requirements. Get 25 pre-approved self-study American Dietetic Association credits at no additional charge when you purchase the book. Email hark@lisahark.com for further instructions. Horace DeLisser, MD: After receiving his medical degree from the University of Pennsylvania in 1985, he remained at the University to complete his internal medicine residency and pulmonary medicine fellowship, as well as post-doctoral research training. He is currently a pulmonary and critical care specialist and an Associate Professor of Medicine at the University of Pennsylvania, School of Medicine. Scientifically, Dr. DeLisser has a program of independently funded research that is focused on the cells that line blood vessels (endothelial cells) and their activity during inflammation and the formation of new vessels. Dr. DeLisser has been also been very active in medical education with a particular interest in cultural competency. He is a course director of the first year medical student course, “Culture and Communication” and is the Co- investigator for the NIH, NHLBI funded grant “Cultural Competence Health Disparities Training Program”. He precepts and teaches in several of the medical school’s courses on humanism and professional. Additionally, Dr. DeLisser helped to develop the course, Spirituality in Medicine. In recognition of his contributions to medical education, he earned the Leonard Berwick Memorial Teaching Award, a First Year Medical School, Class, Outstanding Teacher Award, a Penn Pearls Teaching Award and the 2005 Robert L. Mayock – Alfred P. Fishman Teaching Award. Lisa Hark, PhD, RD is a renowned family nutrition expert with over 20 years of experience in nutrition counseling and promoting the benefits of healthy eating in children and adults. As Director of the Nutrition Education and Prevention Program at the University of Pennsylvania School of Medicine in Philadelphia for the past 18 years, she is a leading nutrition educator of medical students and doctors. She is currently Project Director for the Cultural Competence Health Disparities Training Program”, a five-year grant funded by the NIH, National Heart, Lung, and Blood Institute. Recently, she was the host for season one of the new television series "Honey, We're Killing the Kids", which airs on TLC. Dr. Hark is the editor-in-chief of numerous books including Medical Nutrition and Disease: A Case-Based Approach (Blackwell Publishing), which is now in its 3rd edition and used in many medical schools, physician assistant, nursing and dietetic programs in the US and around the world. In 2004, she edited Cardiovascular Nutrition: Disease Management and Prevention (American Dietetic Association). In 2005 and 2006 she co-authored Nutrition For Life and The Whole Grain Miracle Diet (DK Publishing). Her current book, The Complete Guide to Nutrition in Primary Care, (Blackwell Publishing), will be released in 2007 and is aimed at primary care clinicians, nurses, physician assistants, and nutritionists.